SALEEN and SOEC present the World’s Largest Saleen Show, celebrating the community, culture and company of Saleen automotive enthusiasts. Join Steve Saleen, the Saleen family and the team at Saleen Headquarters as we welcome the Saleen Owners and Enthusiasts Club and all Saleen owners and enthusiasts at their annual open house and car show. This is the world’s largest gathering of Saleens in the world! Scroll down for Saleen Headquarters map and hotel details/map. More than 25 Saleen classes! Classes for other Mustangs and Fords, plus Chevrolet, Camaro, Dodge and Challenger, and more! Special Display Only category for those who don’t want their Saleen judged — bring your daily driver or fixer-upper! Steve Saleen will autograph Saleen vehicles after the show — please be by your Saleen vehicle to have it signed. Comfortable accommodations at a special event price, it’s only 1.4 miles away on the other side of the 91 freeway and up Frontage Road. Special Saleen rate includes breakfast. All rooms have microwave, fridge and coffeemakers (with coffee) and free wireless. Double occupancy rooms with double-doubles or a king. Inquire at the time you make reservations for the best room layout that suits your needs. Free parking. Some room for trailers (inquire at desk). There is a do-it-yourself car wash nearby off 6th Street. Call Ayres Suites Corona West directly at (951) 738-9113 and ask for the “Saleen” rate.Room block at that rate is limited, and is good for the full weekend from Thursday-Sunday or as they have room, but you should book by Sept 1. Clarify room amenities and layout at time of booking. Room upgrades available. It’s a nice, clean, casual hotel, pool for the kids, and a good Mexican restaurant next door. For over 30 years Saleen has set the precedent for performance and innovation in the performance vehicle market. 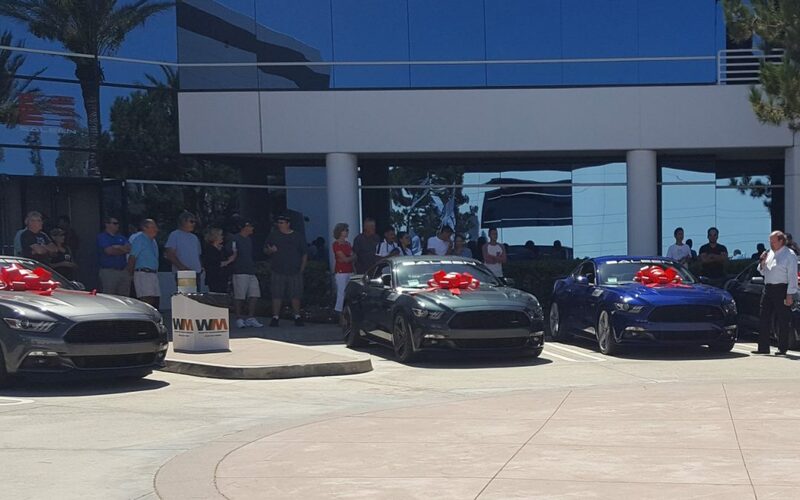 For 20 of those years Saleen has celebrated their customers, friends, and employees with an annual car show and open house. The most recent being their 20th Annual show. Held at their headquarters in Southern California, they saw thousands of people enjoying over 200+ Saleen vehicles from all over the country. Everything from Saleen Foxbody Mustangs to Ford GT(40)s and everything in between were in attendance. Prior years’ events included: a first look at the Saleen GTX Tesla and the all-new 2015 302 Black Label colored in signature Beryllium Metallic paint. This year was no different with 4 new S302 Yellow Labels being delivered to their new owners! 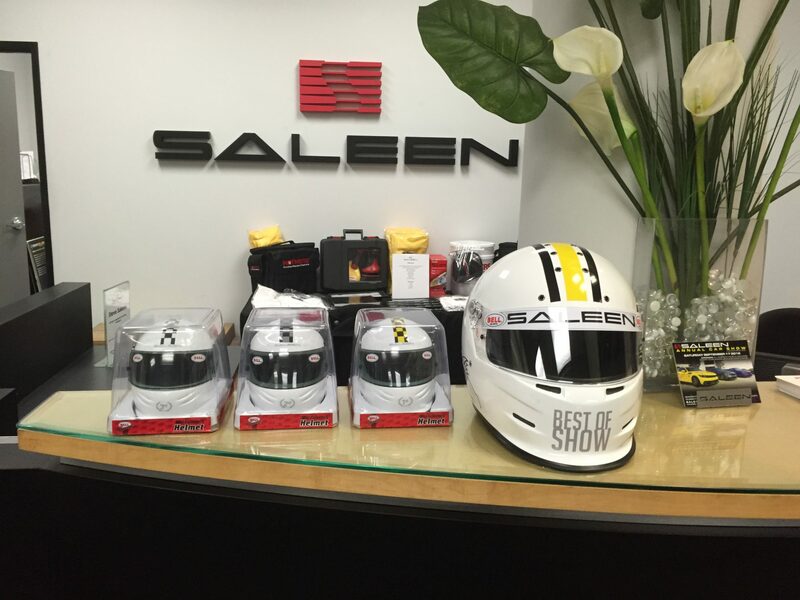 This year’s trophies were class specific mini-helmets, all with a Saleen livery and signed by Mr. Saleen himself.. With next year’s event being the 21st annual, Saleen is expected to go bigger and better than ever before. For more information, visit SaleenShow.com.